Scientists have shown the many advantages of dark chocolate, but consumers prefer the taste of milk chocolate. Fortunately, everyone wins in this rivalry, because all chocolate provides you with some health benefits. A 2016 paper in the journal Geography gives a detailed description of the steps used to make chocolate. Theobroma cacao trees produce chocolate fruit from their spring flowers. Manufacturers press the seeds of this fruit to separate the cocoa butter from the cocoa solids. Chocolate makers add flavorings, sugar and milk to the cocoa solids to create the final product. A critical moment comes when they decide what percentage of cocoa solids to add to the mix. The amount of cocoa in milk chocolate ranges from 7 to 15 percent. In dark chocolate, it ranges from to 30 to 70 percent. You can buy chocolate with any percentage of cocoa content. That is, chocolate products with no cocoa and those with pure cocoa are readily available. Manufacturers, unfortunately, can use the word chocolate to describe all of these products. Nonetheless, each percentage has a unique profile of texture, color, taste and nutrients, creating a product with advantages and disadvantages. The average American spends about $60 a year on chocolate products. This expenditure buys about 10 pounds of chocolate. If given a choice, more people will select milk chocolate than dark chocolate. Milk chocolate has a larger market share in the U.S., but the dark chocolate market is showing greater growth. Doctors have actually started to recommend chocolate for its medicinal properties. Consumers have become increasingly aware of the health consequences of their choices, including consuming too many calories and too much sugar. These societal changes have made chocolate even more popular. A food has a high energy density when it gives you more than 1.75 calories per gram. Both types of chocolate meet this criterion. Eating 100 grams of dark chocolate provides 598 calories. The same amount of milk chocolate gives you 579 calories. Read more: Does Chocolate Give You Energy? On a daily basis, your body is bombarded by free radicals that lead to oxidation that can affect your health. Eating foods with abundant antioxidants may protect you from the free radicals and the oxidative damage. Scientists consider chocolate a potent antioxidant. Yet, it remains unknown what aspect of chocolate causes these effects. A 2016 report in Food Chemistry looked at the antioxidant potential of chocolate samples. The researchers divided the samples into dark chocolate and milk chocolate. The results showed that dark chocolate has a larger antioxidant potential than milk chocolate. It also has greater amounts of procyanidins and phenols. Read more: What Foods & Drinks Are High in Antioxidants? Other antioxidants in chocolate include a group of chemicals known as flavonols. Eating foods with abundant flavonols may help you keep your memory intact as you age. These findings suggest that chocolate may also improve the brain power of healthy adults. A 2016 paper in Appetite tested this hypothesis. The authors of this study gave nearly 1,000 people an intensive battery of tests and evaluated their daily diets. The results showed a strong correlation between psychological performance and chocolate intake. Participants eating more chocolate performed better on the tests. The authors of the 2016 paper didn't have their subjects specify whether they mostly ate dark chocolate or milk chocolate. However, a 2018 report in JAMA Ophthalmology did address this issue. These researchers showed that dark chocolate was superior to milk chocolate based on several cognitive tests. Chocolate also has well-known properties that boost alertness. Caffeine appears to mediate these effects. Dark chocolate and milk chocolate have a similar amount of this stimulant, and both increase alertness. However, flavonols may play a role in creating this effect, as well. A 2016 article in the Journal of Hypertension compared the effects of low-flavonol semisweet chocolate versus high-flavonol dark chocolate on alertness in a group of healthy sleep-deprived participants. The subjects ate 100 grams of chocolate two hours before a night without sleep. Compared to regular chocolate, dark chocolate was better at improving alertness during 24 hours of sleep deprivation. According to the 2016 article, dark chocolate also caused a larger increase in blood flow to the brain than regular chocolate. 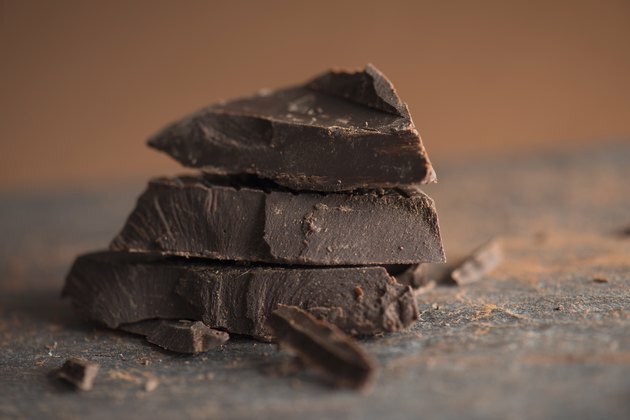 The authors speculated that the greater blood flow seen after the consumption of dark chocolate contributed to the alerting effects of flavonol-rich chocolate. Read more: Can Eating Too Much Dark Chocolate Make You Sick? Chocolate has other beneficial effects on your heart. A 2017 article in the journal Heart showed that eating any type of chocolate at least once a month may lower your risk of atrial fibrillation, or heart flutter. Similarly, a 2016 paper in Nutrients showed that people with moderate chocolate intake had a 16 percent lower risk of heart failure. Read more: Why Does Chocolate Cause the Heart to Skip a Beat? Moderate chocolate intake appears to help you fight diabetes, as well. A 2015 report in Clinical Nutrition reviewed the many studies in animals and humans supporting this claim. They also tested the hypothesis by analyzing the data of nearly 8,000 U.S. citizens. The results showed that you should eat two to six servings of either type of chocolate per week to reap the health benefits of chocolate. The mechanism underlying this effect remains unknown. A 2016 review in Nutrients suggested that cocoa's ability to improve your health without causing weight gain plays a critical role. The authors of this review believe that eating as little as 10 grams of high-flavonol dark chocolate each day can prevent diabetic complications like heart disease. Milk chocolate, in contrast, doesn't seem to produce a similar effect. Read more: Does Chocolate Raise Your Blood Sugar? Eat Chocolate to Fight Cancer? Consuming chocolate may also help you ward off cancer. A 2016 article in Diseases looked at the relationship between chocolate intake and cancer risk. Flavonols in chocolate, like catechin, may lower your risk of colorectal cancer. However, eating a diet rich in chocolate doesn't necessarily lower your cancer risk. The authors of the 2016 article suggested that this inconsistency came from including milk chocolate use in the analyses. After all, milk chocolate lacks the abundant flavonols believed responsible for the anti-cancer effects of chocolate.